This is a legacy page. The information on this page is obsolete does not apply to most people building a new computer nowadays. Almost no one uses floppy drives or EIDE drives anymore. I'm leaving it up for historical reasons and because the site stats indicate that some people still search for this information. IDE/EIDE cables are used to connect older-style PATA hard drives and other PATA devices such as optical drives, tape drives, or ZIP drives to the computer's motherboard. 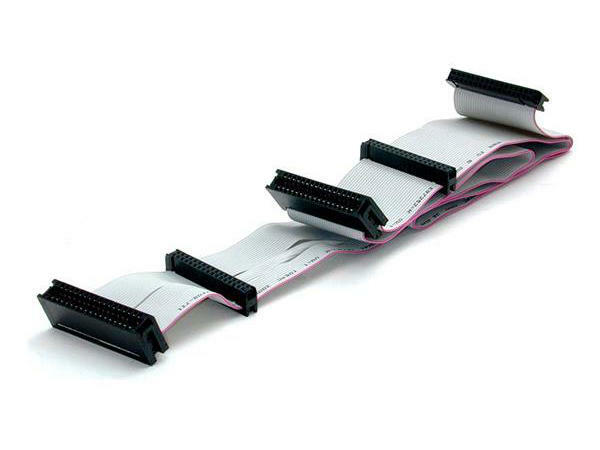 Traditionally, IDE cables were flat, gray, ribbon-type connectors. Older (ATA-33) IDE cables had 40 conductors and forty pins. Newer ATA-133 EIDE cables have 80 conductors, but still have forty pins. The newer cables must be used with EIDE components. If not, they will operate at lower, legacy speeds. The colored stripe along one edge of the cable aligns with pin number one on the device and motherboard connectors. There also is a tab on the cable connector and a notch on the drive or motherboard that makes it difficult (though not impossible) to connect the cable backwards. There are also round IDE cables that don't interfere so much with airflow inside the computer and are somewhat easier to route in most cases. The blue connector gets attached to the motherboard. The black connector attaches to the master drive or device. The gray connector attaches to the slave drive or device. 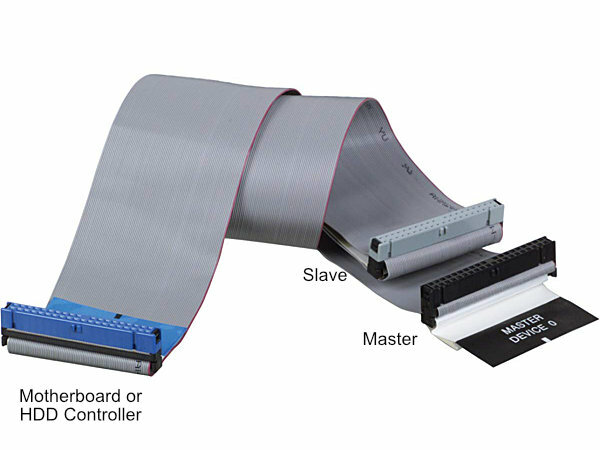 The off-center middle connector gets attached to the slave device. The connector closest to the middle connector gets attached to the master device. The connector farthest from the middle connector gets attached to the motherboard. Floppy drive cables look a lot like IDE cables except that they are a little narrower, have only 34 conductors, and have a twist at the end of the cable that attaches to the drives. They may have from two to five connectors: one to attach to the motherboard, and as many as four drive connectors, only two of which can be used at a time. The reason there are more connectors than the number of drives supported is that prior to the advent of hard drives, most PC's had two floppy drives (A: and B:), both of which were connected to a single controller by the same cable. When the ancient 5.25-inch floppy drives were replaced by 3.5-inch drives (which have different connectors), cable manufacturers began including both types of connectors on floppy drive cables. So the same cable could have one connector for the motherboard, two connectors for 5.25-inch drives, and two connectors for 3.5-inch drives. But the total number of floppy drives is still limited to two. The unused connectors simply dangle inside the case. Since few computers today have two floppy drives (most don't even have one anymore), and most of us haven't seen a 5.25-inch drive in years, most floppy cables manufactured in this century have only two connectors. The end with the twist gets attached to a 3.5-inch floppy drive, and the other end gets attached to the motherboard or floppy drive controller.